A massive study on solar power by researchers at the Massachusetts Institute of Technology came to two main conclusions: Solar energy holds the best potential for meeting the planet's long-term energy needs while reducing greenhouse gases and federal and state governments must do more to promote its development. The main goal of U.S. solar policy should be to build the foundation for a massive scale-up of solar generation over the next few decades, the study said. "What the study shows is that our focus needs to shift toward new technologies and policies that have the potential to make solar a compelling economic option," said Richard Schmalensee, a Professor Emeritus of Economics and Management at the MIT Sloan School of Management. Federal and state subsidy programs designed to encourage investment in solar systems should be reviewed with an eye on increasing their cost-effectiveness and with a greater emphasis on rewarding production of solar energy, the study said. For example, the federal government's solar investment tax credit (ITC), passed in 2008, is set to expire next year. 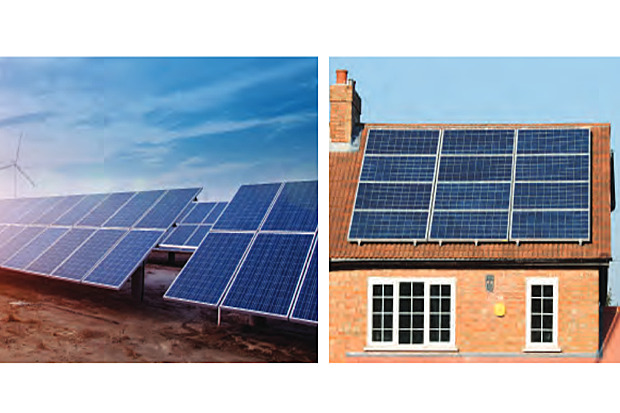 It offered a 30% tax credit for residential and business installations for solar energy. When it expires in 2016, the tax credit will drop to a more permanent 10%. The MIT Energy Initiative (MITEI) released results of the study in a 356-page report, The Future of Solar Energy, on Monday. The study found that even with today's crystalline silicon photovoltaic (PV) technologies, the industry could achieve terawatt-scale deployment of solar power by 2050 without major technological advances. A terawatt is a trillion watts of electricity. The study focused on three challenges to achieving that goal: developing new solar technologies, integrating solar generation at large scale into existing electric systems, and designing efficient policies to support solar tech deployment. The researchers undertook the study and published their findings because of the "enormous potential of solar energy as a tool to reduce global CO2 emissions and the great importance of effecting those reductions." Solar electricity generation is one of "very few low-carbon energy technologies" with the potential to grow to very large scale, the study said. "As a consequence, massive expansion of global solar-generating capacity to multi-terawatt scale is a very likely and essential component of a workable strategy to mitigate climate change risk." The research strongly recommends that a large fraction of federal resources available for solar R&D focus on environmentally benign, emerging thin-film technologies that are based on Earth-abundant materials. "The recent shift of federal dollars for solar R&D away from fundamental research of this sort to focus on near-term cost reductions in c-Si technology should be reversed," the researchers said. 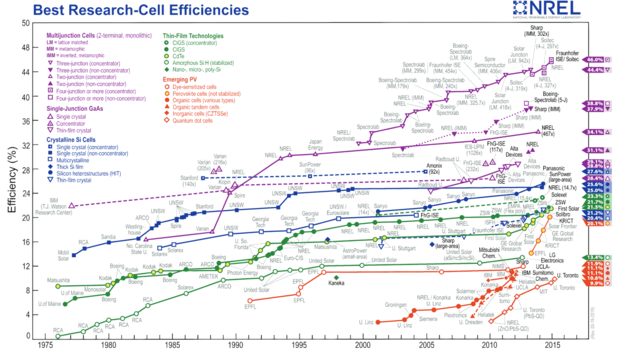 Crystalline silicon dominates today's PV landscape and will continue to be the leading deployed PV technology for at least the next decade, according to MIT. Crystalline silicon (c-Si) solar cells are divided into two categories: single-crystalline (sc-Si) and ulticrystalline (mc-Si). The higher crystal quality in sc-Si cells improves charge extraction and power conversion, but requires wafers that are 20% to 30% more expensive. 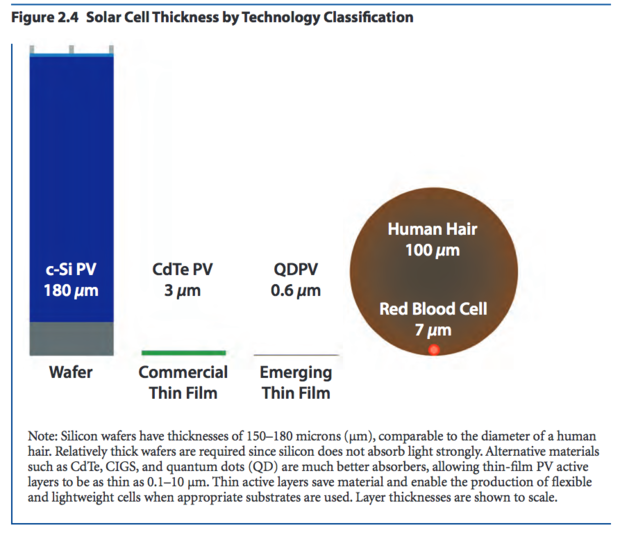 Some new thin-film technologies, made by depositing one or more thin layers, or thin films of photovoltaic material on a substrate, such as glass, plastic or metal, could save money on installation and PV module costs. "Massive expansion of solar generation worldwide by mid-century is likely a necessary component of any serious strategy to mitigate climate change," the study concluded. "Fortunately, the solar resource dwarfs current and projected future electricity demand. 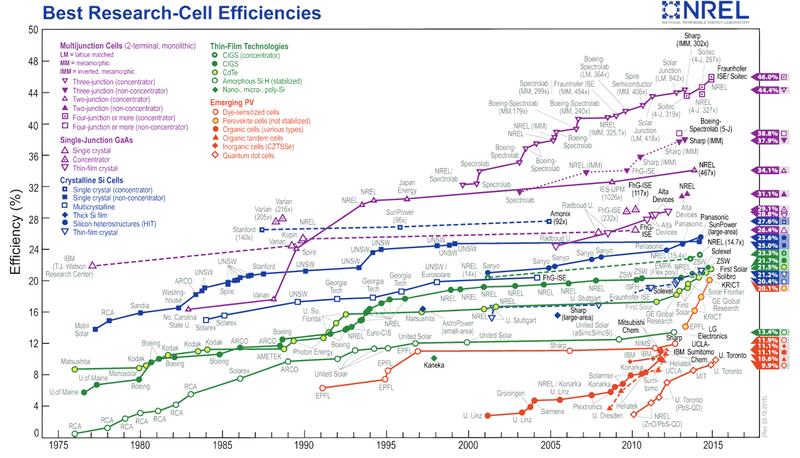 In recent years, solar costs have fallen substantially and installed capacity has grown very rapidly."